The composer’s autograph is accompanied by the name of a rented cottage near Malvern where he added the finishing touches to his symphonic masterpiece. There is a long confident line drawn beneath the signature pointing down and leftwards towards the Fine. A smaller line extending upwards to the right from the Fine completes the checkmark formation. This inverted checkmark resembles an angular L, or more significantly, an inverted 7. The latter resemblance is discreetly reminiscent of Elgar's remark, "The drop of a seventh in the Theme (bars 3 and 4) should be observed." An inverted 7 gives the appearance of a 7 that has fallen down. There are seven days in a week, so that particular numeral is associated with endings. The Italian term Fine also denotes an end. The premiere of the Enigma Variations heralded the end of Elgar’s relative obscurity as a provincial composer, ushering in an era characterized by substantial commissions and gigantic works. 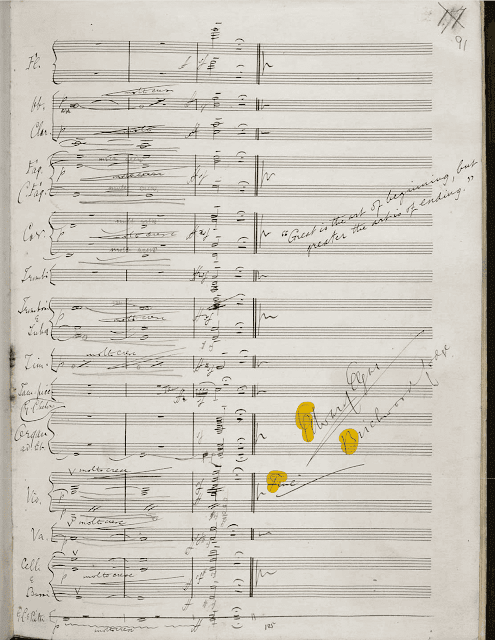 The similarity of these two lines to a checkmark added by Elgar at the end of the revised Finale suggests one should check this particular area of the score. It is the culmination of a powerful orchestral peroration. The prominence of the ending over the beginning is bolstered by a fragment from stanza XIV of Longfellow’s Elegiac Verse cited at the top of the same page, “Great is the art of beginning, but greater the art is of ending.” It is remarkable the Roman numerals for that stanza are identical to those for the Finale. The Longfellow citation, checkmark arrangement of words, and the term Fine collectively imply that the key to unravelling Elgar’s enigma is to the focus on endings rather than beginnings. What could be so significant about how Elgar finished the extended Finale, a martial and triumphant self portrait? Three features are markedly divergent from the original. There is a new ending, a new quotation, and a new location. Elgar composed the Enigma Variations at Forli, his residence in Malvern. He added the extension to the Finale at Birchwood Lodge. He quotes a paraphrase of a poetic fragment from Tasso’s La Gerusalemme liberata at the conclusion of the original Finale. It is a paraphrase because although the literary source remains apparent, he altered some of the words from the third to the first person. 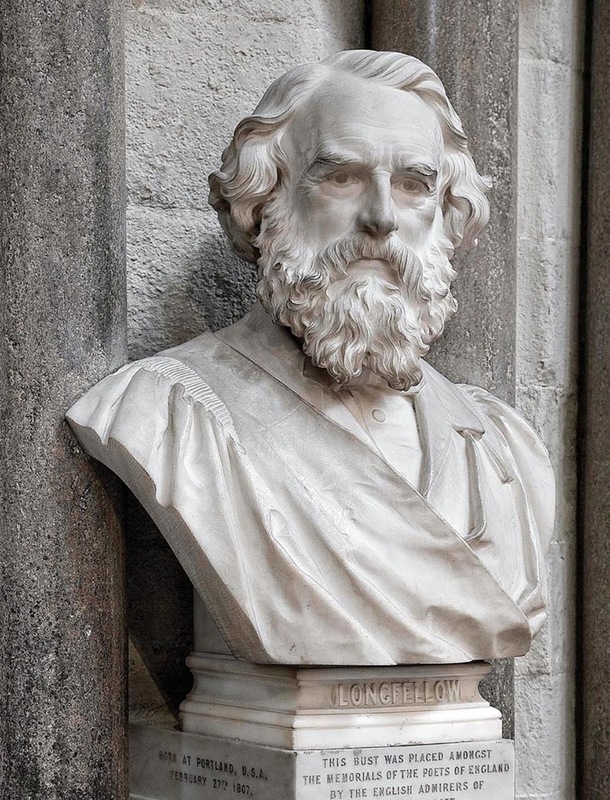 For the extended movement, he cites an unaltered fragment by one of his favorite poets, Longfellow. The Finale’s ending is altered, but the accompanying quotation remains intact. On closer inspection it was determined that the first letters from the first words of each line entry (Edward Elgar, Birchwood Lodge, and Fine) encode the initials for Ein feste Burg. These same three letters appear twice as “FEb” on the original cover page, and a third time as “FEb” on the last page of the original Finale. Multiple lines of evidence verify that Martin Luther’s famous hymn A Mighty Fortress is the covert Theme to the Enigma Variations. This particular cipher is an acrostic anagram, a series of first letters from first words that may be reshuffled to unveil the decryption. The name of this cryptogram is the Appended Finale Acrostic Anagram EFB Cipher. It ranks as just one out of over sixty different cryptograms dispersed throughout the Enigma Variations. There are two other acrostic anagram ciphers in the Enigma Variations that share striking similarities with the Appended Finale Acrostic Anagram EFB Cipher. The first is the Letter Cluster Cipher which is comprised of first letters in the titles of Variation XII (B. G. N.) and Variation XIV (E. D. U. and Finale). The titles of those two movements immediately before and after Variation XIII are an acrostic anagram for the initials of Ein feste Burg. Those three letters are the solution to the cryptic title (***) of the intervening movement, Variation XIII. Elgar literally framed his baffling asterisks with the answer, accounting for his numerous reorderings of the Variations to construct that particular cipher. In his book Elgar: Enigma Variatons, Julian Rushton does an admirable job of documenting these divergent lists, yet fails to detect or decode Elgar's rather elementary cryptogram. In detailing these varying compilations, Rushton missed the forest for the trees. One key feature is that Elgar incorporates his full name or initials within these acrostic anagram ciphers. This is part of a larger pattern involving a variety of other cryptograms in the Variations. It is possible to casually dismiss one acrostic anagram as a fluke, but not two or more. A third acrostic anagram formed by the Performance Directions in the Enigma Theme's opening bar is another extraordinary example of Elgar's affinity for this method of encipherment. Like the other acrostic anagram ciphers, its decryption includes the composer's initials. That makes three different acrostic anagrams in the Enigma Variations that harbor Elgar's initials or complete name. It stands to reason that Elgar inserted his name or initials within these cryptograms to serve as a stealth form of authentication. It is long overdue for career academics like Julian Rushton to wake up and smell the scores of ciphers lurking in the Enigma Variations. Elgar was an expert in the field of cryptography, and these ciphers bear his cryptographic fingerprints. To learn more about the riveting secrets of Elgar's breakout orchestral work, check out my free eBook Elgar’s Enigmas Exposed.